At age 2-3, children are more inclined to learn since they now have a better grasp of their world and have a better command of their language. At this point, they can easily communicate what they want and how they want to do it. This stage is very pivotal to prepare them for greater learnings in the future. My Little University understands the needs of these toddlers to discover and learn more so we included the following programs and activities to ensure that they are making the most out of their daily waking hours. Language and Literacy. Children learn the most out of actual interactions so we make sure that we fill their days with pretend play, book reading, and other activities that will encourage them to speak more and be exposed to a wider vocabulary. Social Development. 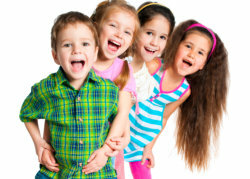 We provide for more group plays at his stage encouraging the fostering of friendship among little ones. Classroom lessons. We start to incorporate more classroom activities and structured plays that will teach them counting, shapes, colors. Creative Expression. We encourage children to express themselves more positively through arts, pretend play, and movements that will encourage them to understand and control more their emotions. They were not joking when they coined the term terrible two. But with proper guidance and the right avenue to channel their energy, these “terrible two’s” will turn out to be not so terrible after all. Schedule for a campus visit soon.